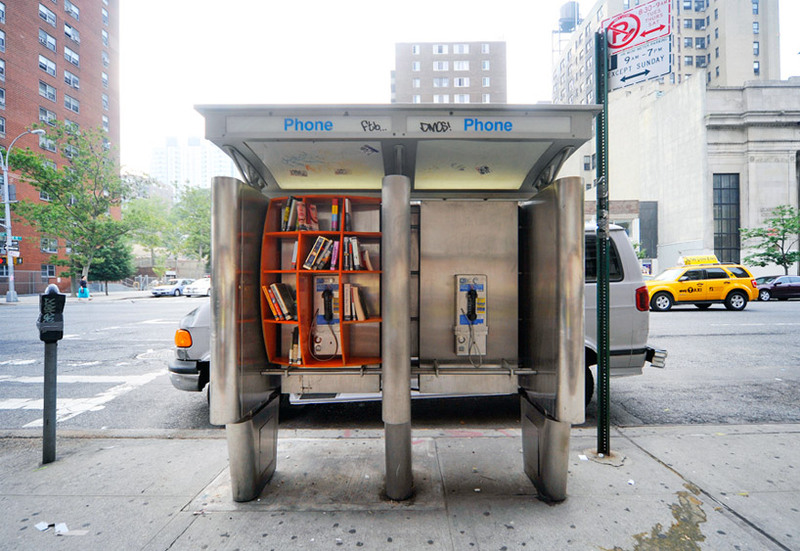 on the streets of new york architect john locke has repurposed phone booths into communal libraries or book drops, installing bookshelves within the structures filled with books for residents to take, borrow, or exchange. the phonebooth shown here, ‘DUB 002‘, is part of his ‘department of urban betterment‘ interventionist project. adopting the same concept as james econs’s ‘phoneboox‘ in the UK, locke’s project consists of a machine-cut and assembled plywood shelf, designed with indents to hang securely to the interior of the phone booth without the need for any additional fasteners. the pay phone and all signage remains completely viewable and operable, nestled within the frame of the bookshelf. installed in manhattan valley and morningside heights, the design is easily replicable in phonebooths throughout the city. all books in the project were donated by local residents. brooklyn-based fabricators kontraptionist milled the plywood for the shelving. … as an idea model it’s great … as an attempt to strengthen a community it’s ok, and as an art instillation it’s nice. Unfortunately it will become a trash cubbyhole. This story will lose its luster quickly and the project will do the same shortly after. No follow up to the project 6 months from now will take place from the media or from the designer. The best feedback will come from the men that clean these booths, who unfortunately will never be heard. I found it interesting also that a project hopes to revive an obsolete piece of equipment with books which are unfortunately becoming obsolete as well. I don’t think books will become obsolete any time soon. Apart from that, I think you’ve got a point, “o0odesigno0o”. It’s a shame about the spelling of “anachronism” in the graphic. Brilliant bit, though. won’t catch me browsing those microlibraries, no matter how cool they are. phonebooth is just another word for public urinal. That would be something. I can hardly find a payphone at all here in San Francisco anymore, let alone an operable one! I believe the idea is brilliant. Instead to throwing books to the trash, we can try to use them to help the community. This is the kind of project that starts slow; however, after it takes inertia, it can be hard to stop. Keep going! Education is the only future this country have. Cool! But I can already see McDonalds trash shoved in there instead of books. I undoubtedly agree that there should be a move to educating the street scape. But who are you/we to force an idea onto a community that is not accustomed to even going to the library, in an assumption that they need to be educated? Unmonitored, this project will fail in a few months. It’s a disconnect between what we feel, and what a neglected community actually needs. What sort of books will be stored in the cubby-holes? And how will they educate people? Reading a classic alone is not going to get someone a job and miraculously change someone’s life. Not to mention, after a week, those books can be sent to the CDC to be studied, and not read. Maybe instead of books or periodicals, put business cards of organizations that specialize in social services. Why don’t we actually pay attention to what communities need instead of a cool design that imposes a superiority. I love this idea. Very simple and something that should bring a little smile to the face of all who walk by. It is easy to call out all the possible failures of something like this, but that pessimistic mentality is one of the reasons humanity is in such a terrible state. Books won’t ever die. They may go out of fashion, but there will always be a certain romanticism to print media that the internet will never capture, and to have the opportunity to walk down the street and pick up a good read will only add to that experience. The world needs more positive people like James Econs and John Locke. Learn from them and do something good, if only for the sake of doing it. This project has good intentions but unfortunately many people do not. Hopefully you wont see the books torn and thrown in the floor become an eye sore, because certain people can’t see anything positive and leave it to those who will cherish it. You know what…I’m going to hold out that people wlll actually not turn them into trash receptacles. THAT IS AWESOME!!! I will peak into every phone booth I see in NYC from now on in hopes of seeing at least one of these. Brilliant 🙂 One way to make sure you always have something to read. Got my vote! Looks great and it’s an imaginative concept, tho I am saddened by the negativity of some comments here. Maybe it will get trashed, but then again maybe some local residents will be inspired to maintain it and add their own books. Nor does it claim to cure all social problems or reduce unemployment. It might however add a bit of pleasure to some people’s lives. Brilliant idea. But what is necessary is a couple of area resident volunteers to keep an eye on it. Along the Philadelphia Main Line Septa Commuter Railroad we have bookshelves inside every train station stocked by a volunteer from each town’s Library and the books just fly out of there. Very successful. jenny db, good point about “it may become a trash cubbyhole”. if i live in NYC, if i had one of these public library in my neighborhood, i will go to clean it once a week if i do not have a book to place there. how hard will that be? 10 shelves. if someone makes it, an endless group of people fills it, a few other people cleans it. that is communal, that is active citizenship.